You had been working very hard in the last few months looking for a suitable job. Your luck just smiled on you when you saw the job offer email or the mail containing the new job offer, which you had been pursuing seriously in the last few weeks. You feel a rush of emotions, as the competition was stiff and the job was a coveted one. Once the initial exhilaration settled down, you started reading the job offer in detail and then started making plans for writing thank you letter, in reply to offer letter email or the job offer mail. However reading through the job offer details you have a few queries in mind which you analyze by yourself. Do you accept the offer or try to negotiate on a few things? Miriam Salpter in an article titled “7 Tried-and-True Steps for Negotiating a Job Offer” is of the opinion that most people do not want to negotiate a job offer and especially people in USA are not very confident when negotiating job offer. Thus you have to decide whether you want to negotiate your job offer or not. If you feel that the compensation offered is not suitable according to you then you could request for a revision of compensation. But before you do this, it is essential that you look into the market and understand the nature of compensation being drawn by people with your skill and experience. Are you open to accept a few concessions? In case you are open to negotiate on your job offer, you have to accept the fact that you would need to make certain concessions in your job. Thus after reading the job offer, you have to examine candidly what are the areas you can compromise on and where cannot compromise. For example you can negotiate that your family should enjoy health insurance benefits. But this negotiation cannot be undertaken on the basis that you forfeit a large chunk of your take home salary. This would affect your financial status in a major way. If you are joining this company and planning to work there for a few years in order to grow your career, it would be a good decision to hold on to the negotiations for a while and show the company how you can add value to it. Once you have shown that, you can negotiate the terms you want and the company would happily agree to it also. You have to understand that companies lay great significance on retaining a good employee. They know that the employee is an asset to them and they would do anything to keep them happy. When you receive a job offer, it is essential to show that you are grateful that you have received an opportunity to work with the esteemed company. When you write a thank you letter for job offer to the hiring manager, you are showing the fact that you are professional and also a gracious one. This letter would set the level of communication for you in the future company. Before you write the thank you letter, it is essential that you make a rough draft of it. The draft would contain the basic points you want to write in it. Here the language should be professional and crisp. Remember the hiring manager when reading the letter would assess your business letter writing skills. Thus the letter has to be perfect in all respects. When you write the thank you letter, it is mandatory that you address it to the main hiring manager. You might have met a number of people during the interview process but you need to write to him as he has sent you the job offer. It would be good if you thank the hiring manager for his efforts. This would indicate that you consider the hiring manager’s time valuable and appreciate the fact that he has gone out if the way to accommodate you. Since you are joining the organization a little PR would always do you good. One of the important things to confirm when writing thank you letters for job offers is to confirm your date of joining to the company. In case you feel that the date of joining needs to confirmed after you speak with the HR of your present company, do mention that. Here also mention the date by which you would specify the confirmed date of joining from your end. This small effort would create an impression that you stick to your deadlines and this is one of the major attributes any company would want in his new employees. When writing the thank you letter it is essential that you show your enthusiasm that you are happy to be a part of this company. Thus you can write this and also establish the fact the company is a leader in the industry. By mentioning that the company is a leader in the industry you are emphasizing and recognizing the prestige of the company. This is very essential when you are starting a new job in a company. When concluding the letter, you can mention the fact you are happy to join the company and you are eager to use your work experience and skills to help the company achieve its objectives and goals in the near future. This simple statement would reinforce the hiring manager that he has taken a good decision in recruiting you. Once you have completed the thank you letter, proof read it and keep it free from any grammatical mistakes. The letter should create an impression that you are meticulous in your work. What To Include in a Thank You Letter? 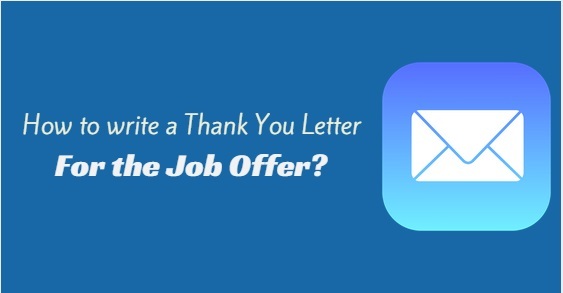 When writing the thank you letter after job offer is received, you have to understand that the way the letter is written would indicate the perception the new employer has of you. Thus the letter should contain certain elements in it. When writing the letter you would need to be very specific. The letter should also contain your contact details even though they might be present in the resume you had submitted earlier. Nowadays we use simple business language for all major business correspondence. When replying to a job offer letter do not use flowery languages. Remember this is not an essay competition where you have to show your knowledge of the language. The language should be simple and crisp. After addressing the hiring manager, thank the company and the hiring manager for giving you this job opportunity. Here you show your enthusiasm by mentioning that you are excited to meet your new team and also learn how you can contribute to the positive growth of the company. The reader of the letter would understand the fact that you are planning ways by which you can use your skills to create profit for the company and that is a good attribute in a new employee. In the letter it is essential that you confirm the terms and conditions which have been offered to you along with the date of joining. In case you have to undertake a physical examination or a training program mention a date by which you expect to complete it. When you mention these details in the letter, then the company would get the impression that you are organized and meticulous in your work. In the end you can ask the employer if they need any other details from you before starting the new job. Also mention if you are relocating to a new location, that you would hand over the basic relocation expenses receipts on the day you are joining your new company. In case you have any doubts over small issues you can put them down in the letter and request for a clarification in the matter. Having completed the thank you letter to employer for the new job offer, you would feel elated that your hard work has finally paid off after months of struggle. It would also be a good idea to speak to the hiring manager once you have sent the thank you letter by mail. This would give the personal touch so necessary and also be the beginning of a positive professional relationship with him in the days to come. You cannot rest, as you have to speak to the HR of your current company and understand the pending things that you have to clear and who do you need to transfer your current job responsibilities before you start a new phase of career in your new job. Yes you would still have to work hard but this would be the beginning of a new phase in your career. Next articleHow to Prepare for a Technical Phone Interview?